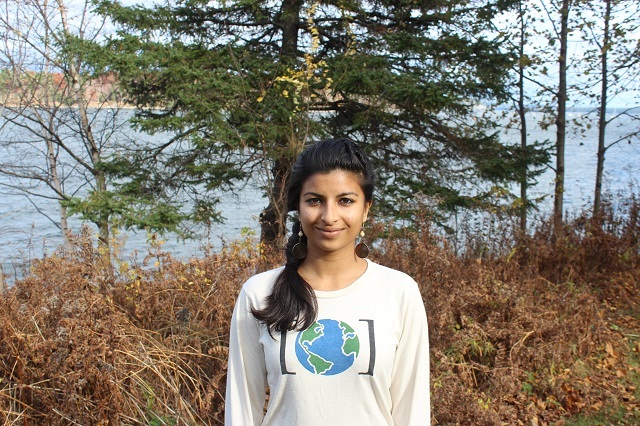 In 2011, Anjali Appadurai gave a powerful speech at the UN climate talks on behalf of the youth of the world. She hounded negotiators for their lack of ambition, broken pledges and betrayal of future generations. In an exclusive interview with Ceasefire, she reflects on the incremental progress made in Warsaw in December, why a colonial attitude and corporate interests are holding us back, and on the solutions and strategies that can take us forward. Appadurai continues to track the negotiations with Third World Network and Earth in Brackets. You can view her 2013 TEDx talk and follow her on Twitter. AA: I think the world is getting very tired with the UN talks because “progress” is not really a term that can be used to characterise them. Since Copenhagen [in 2009] – which seemed like the last window of hope to create a legally binding agreement – it seems that progress has been getting smaller as the issue becomes more urgent. We didn’t really see any urgency in Warsaw. Having said that, one of the breakthroughs was the creation of a Loss and Damage mechanism which has been in the works for 20 years now. It’s been a real fight, a really contentious issue and public pressure was really important in pushing this through. Even though it was not as comprehensive as people wanted it was a very significant step because it shifts the discourse to one that recognises, ‘OK we’ve come so far without any progress that we now need to start turning our attention to compensation for loss and damage that has already occurred.’ That’s changing the policy landscape and it’s changing what the most impacted people are pushing for. So it’s now being seen as the third major pillar of the solution: mitigation, adaptation and now loss and damage. Because, as you know, even if we stopped all emissions now, the impacts of climate change are locked in for centuries to come and there will be people that will be impacted disproportionately from that. PE: The UK Secretary of State for Energy and Climate Change, Ed Davey, thinks that the way in which the Loss and Damage Mechanism was set up means that rich countries have successfully avoided the issue of historical liability and responsibility for extreme weather events that are now impacting poor countries [p.19-21]. The decision merely “requests” rich countries to provide poor countries with financial support. AA: That’s because in the mind of the US and EU historical responsibility shouldn’t matter any more. At the very last minute, and at the insistence of the US, the mechanism was placed under the Cancun Adaptation Framework which is so notoriously underfunded and ineffective that it’s an embarrassment to the Convention. The Adaptation Fund itself finally achieved a preliminary goal of $100 million which is nothing when you consider the cost of adaptation per year is over $4 billion and increasing exponentially. In a legal sense “loss and damage” is about liability and compensation so this fight will continue as the science around the attribution of responsibility for extreme weather events grows stronger. The fight over markets was also a small success. New market mechanisms and a global carbon market were successfully resisted by developing countries at Warsaw. Text that would have allowed for a global carbon market was prevented from being written into the convention. PE: We need to peak emissions by 2015 to give us the best chance of staying within 2C or 1.5C temperature rise. This is a huge ask. Emissions are rising at an unprecedented rate. We need big, effective ideas that can be implemented quickly. This is not something these talks have been historically good at! Are there any big ideas around this issue on the table at the UN Talks? There are several scenarios depending on when emissions peak, but peaking by 2015 is the last one which will enable us to avoid runaway climate change. Right now the developed nations are pushing to peak by 2020. Even though the global agreement will be signed in 2015, it won’t come into effect until 2020. We need to peak emissions before 2020 or else this agreement won’t mean much. Since Durban in 2011, there is an ongoing workstream at the talks devoted to brainstorming specific proposals and solutions to catalyse action before 2020. It should have been a huge area but it has been undermined a very consistent effort from the US, EU and Australia to allocate it less resources. PE: What occurs to me when I think about pre-2020 action that’s fast and effective is things that keep fossil fuels in the ground one way or another. Why haven’t we ended fossil fuel subsidies yet? Since we already have four times as much fossil fuels in our reserves than we can burn, shouldn’t we be banning outright new sources of unconventional fossil fuels such as tar sands, fracking and Arctic drilling? Aren’t these the kind of things we should be talking about? AA: I agree but proposals that specific didn’t make it onto the table! The developed countries prefer market-based mechanisms for dealing with emissions reductions. PE: The civil society walkout on the penultimate day of the talks was a massive statement involving around 800 people. So many of the groups that are usually heavily engaged with the process and have faith in it seemed to turn their backs on the conference in this amazing show of solidarity. What was that about and what were you trying to say? AA: Warsaw was actually the site of a change in approach from civil society. As you know these convergences are very significant: not only for the political process that’s happening but there’s also several thousand civil society representatives in attendance. They can be very fragmented but in Warsaw we saw a real shift in the collective consciousness to accepting that the political process is really not delivering the urgency and the solutions; and the realisation that social movements and civil society will have to step into a larger role, into a more significant stance of power, into a reclamation of the narrative. The change will have to come from the bottom up since it’s not coming from the top down. So the walkout was a very significant act involving youth, environment, farmers, trade unions, women, human rights and indigenous groups. We had unified messages on our t-shirts. The front said “Polluters talk, we walk” which was a reference to the huge corporate influence and especially the influence of the fossil fuel industry and the coal industry. We were saying ‘our job here is pretty much over because you’ve locked in a lot of the decisions and civil society’s voice wasn’t a part of that decision-making process.’ On the back of our t-shirts was “#volveremos” which is Spanish for “we will return”. We’re going to go and gather our people, our movements, strengthen ourselves, organise ourselves and come back much stronger in Peru next year. PE: In your speech to the UN climate talks on behalf of the youth in 2011, you said, “You’ve been negotiating all my life (…) get it done!” What in your opinion is the reason these talks have so far failed to agree meaningful collective action to avoid dangerous climate change – and on the contrary have allowed us to increase emissions by 54% since 1990? AA: I see the interests of the developed nations – primarily the US and the EU – and the corporations as having been the main blocks to progress from day one. The US is a shameless blocker and that’s their persona in any multilateral setting. They are always the exception to the rule and they maintain that as a point of pride. The EU claim leadership but that leadership has not taken the world where it needs to go and in fact has undermined climate solutions. The interests of the corporate sector are pretty much diametrically opposed to the interests of the people and the planet. Yet those interests and voices are the ones that speak loudest. At this conference the US pushed very strongly to require developing countries to report on how they are creating ‘enabling conditions’ – which means how much deregulation they are doing – as a condition for receiving climate finance. Pieces of text like that which support the free trade agenda are constantly being pushed. Also what a developed country concedes in one arena they can withdraw in another – like trade or development aid. There’s supposed to be a certain dollar amount pledged from North to South but a recent report from the UN showed that up to 90% of overseas development assistance has been repackaged and relabeled as climate finance. I think that the UN Framework Convention on Climate Change is beautifully written and if the Convention were the only thing on the table we would be able to come to a successful climate agreement. But there are so many other interests in the way that are seriously undermining the values encoded into the Convention – which are ‘common but differentiated responsibilities’ and ‘historical responsibility’ – and the ultimate objective of the Convention itself. Since Durban in 2011 the developed nations started calling into question these principles because some developing nations were growing in size. The US is saying that because we all live on the same planet we should all equally take on a burden. How do you expect everyone to contribute the same level of ambition when the majority of the world is not enjoying the benefits of human development, education, water, food security, security in general and peace? The majority of the world has not contributed to the problem and continues not to contribute to the problem and yet will feel the worst of it. When you have a bunch of countries in a room without a set of principles to guide negotiations, it’s a free for all. It’s just playground politics: who’s the bully and who’s going to get their way in the end. So those principles are imperative in fashioning an agreement. PE: What about solutions moving forward? AA: Strategically the focus will shift back to social movements and organizing resistance in every region and every country. If the resistance is great enough it makes its way into the negotiating hall by putting pressure on national governments. Social movements need to interact with the political process rather than running away from it, as a lot of them do. In the activist world, fracking groups, tar sands groups, pipeline groups are all really fighting the climate fight. If we could all lower our activist egos and join forces that would be really powerful. That’s the civil society strategy required to battle the fossil fuel industry. Also, the Convention needs to have stronger teeth. Europe’s emissions reductions targets for 2020 – when you pull apart all the loopholes in those targets and in the carbon markets – could actually translate as a significant increase in emissions. During Warsaw, Japan announced it would be increasing its emissions by 3.1% by 2020 compared to 1990 levels instead of reducing them by 25% as it had promised earlier. So we’re seeing major economies put forward numbers like this and there’s no accountability for them to do otherwise. The goal for developed countries should have been to reduce emissions by 40% from 1990 by 2020 and we’re showing increases! A key solution is potentially the relaxation of intellectual property rights (IPRs). All the energy saving and zero carbon technologies are already available, but around 90% of the patents lie in the developed world where they are controlled very tightly by IPRs. One of the main mandates of the Convention is to facilitate technology transfer from the Global North to the Global South and within the South itself, so that developing countries can make the transition to a low carbon economy without going down the dirty path of industrialisation. IPRs have made the technologies very expensive and inaccessible. The developed countries have tried to shut down discussion about IPRs by insisting the conversation takes place in the WTO, even though technology transfer is such a large part of the climate Convention. So the developing countries – mainly led by BASIC which is Brazil, South African and India and China – have spearheaded that conversation. That was pretty hot at Warsaw but unfortunately didn’t yield any concrete results. We really need a part of the convention that supports and brings in community solutions from impacted peoples all around the world, a decentralization of efforts and a greater integration of the UN process and individual community processes. There also needs to be full recognition that the corporate lobby – especially the fossil fuel lobby – is a major barrier to progress. PE: During Warsaw Green MEP Satu Hassi drew attention to an article in the UN World Health Organisation Framework Convention on Tobacco Control that enshrines in international law the principle that tobacco companies should play no role in public health policy. Do you agree that a similar legal instrument could be useful in keeping fossil fuel companies and other vested interests out of climate policy. The problem is partly at national level because governments are captured by corporate interests, but there is also a problem specifically at the UN level I think isn’t there? AA: Yes there is and Warsaw showed us that very clearly, with the coal conference happening simultaneously and the coal community putting forward a communiqué to the conference about “clean coal”. Saying that fossil fuel companies having a role in climate policy is like allowing tobacco companies to determine public health laws is a very powerful comparison. I think people are working on having some kind of declaration to this effect. That would have huge repercussions at the national level as well. PE: Should part of the strategy be to get the word out at the national level about the amount of action that rich countries need to be taking? A fair deal that shares out the very small Carbon Budget the IPCC has told us we have left if we are to stay below 2C or 1.5C will require much greater levels of emissions cuts and climate finance than most people are talking about at present – including rich governments and the media. Even to start talking about the Carbon Budget will be really powerful. There is a very real carbon budget: there is only so much our atmosphere can take. So the atmosphere is a finite pie to be divided amongst all nations and all peoples. If my carbon footprint is 20 tonnes per annum and that has to go down to 2 or 4 that’s going to mean a very significant impact on my life, my society and everything that I hold dear. That’s very much a wake up call to the reality of the future. Climate change is the ultimate issue of the commons and it will be the ultimate tragedy of the commons unless we can figure out some way to solve that ancient puzzle about how to collectively take care of the commons. The earlier we wake up to it, the less painful the transition will be. It’s not that you’ll never have the internet again or that you can’t drive cars anymore. The more we realize that we are in this together, the more we can go about implementing very local solutions – which are supported at the national and international level – to enable us to maintain a really high quality of life which doesn’t continue to harm people abroad and the planet itself. PE: Since developing countries comprise the majority world, there must be some form of power they can wield collectively to push things in a more favourable direction? AA: You would think that if 133 of the 195 countries at the UN have shared interests that they would be a match for the Global North. But because of all the other issues I mentioned earlier that’s not the case. It’s also due to a ‘divide and conquer’ strategy where economic leverage is wielded over these countries. There are different groups within the G77+China bloc – such as BASIC, AOSIS (Association of Small Island States) and the African Group – and when they’re divided into their constituent groups, they are much more easily brought onto the side of the developed country interests. AOSIS for example is famously the group that has conceded to EU interests because they’re so dependent both politically and economically on the EU. On the upside, the G77 was much more unified in Warsaw than I’ve seen them in the last five years. There’s a group called the Like Minded Developing Countries (LMDC) which emerged at the Warsaw talks that was really significant. The group includes India, the Philippines, China, Vietnam and Venezuela and was pushing for what could generally be called G77 interests – i.e. strong finance and mitigation commitments from the developed world in the form of “commitments” rather than “contributions”. They also want strong adherence to Convention principles such as “historical responsibility” and “common but differentiated responsibilities”. The LMDC was quite a strong voice and it was led by Yeb Saño of the Philippines which was really powerful because they were dealing with this very real climate-induced disaster [super-typhoon Haiyan] at the same time as fighting for the solutions in the meeting rooms. PE: One good bit of propaganda could be to rebrand the G77 as the G133 to reflect the number of countries that currently comprise that bloc, just so people understand the basic point that the poor world is in the majority in the talks, and we should be hearing a lot more from them. In the UK all the narrative, if we ever get any news on these talks, is essentially repetition of EU talking points. We don’t get to hear any of these voices. AA: Exactly. It’s a majority of the countries but – perhaps more significantly – it’s a vast majority of the population. I think a full out reclamation of the media narrative needs to be a large pillar of the strategy going forward, because there is a comprehensive effort on the part of the developed world to make a scapegoat out of China and the developing countries to mask the absence of leadership. People often say, ‘why don’t India and China have the same commitments?’ Well, India has 400 million people below the extreme poverty line and an American is responsible for about 50 times more of the total historic emissions than an Indian. That changes the debate. If people read Fiona Harvey in The Guardian for example they might think there’s a bunch of countries out there being loud and selfish and pushing for money. That undermines our very humanity in my opinion. It’s a deliberate blindfold to the reality of the majority of the world’s population and that’s sad and outrageous. So let’s reclaim the narrative! PE: Thank you for talking to Ceasefire. » You have been negotiating all my life. Get it done!